My morning consists of a routine drive to the campus Starbucks to order my usual, iced coffee with a hit of caramel and cream. Shortly after, I arrive at Heuser Art Center, the Fine Arts building at Bradley University. 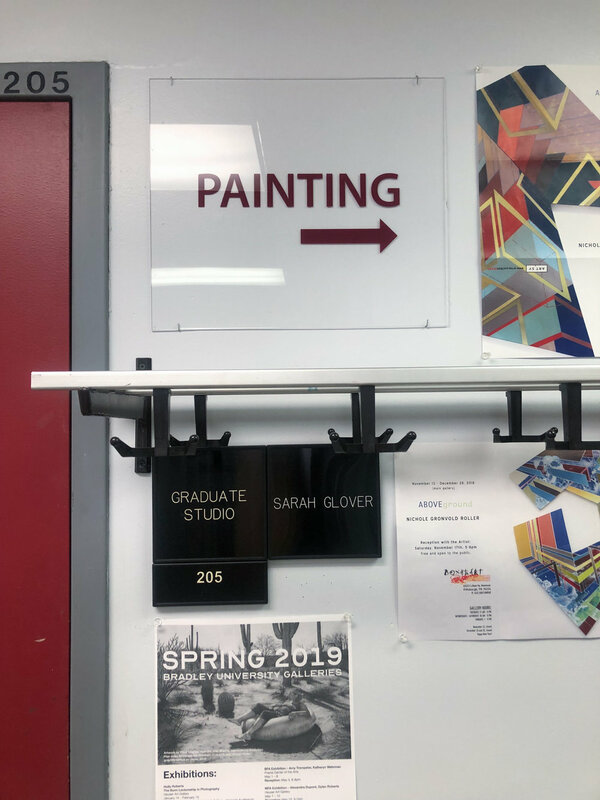 This building has housed over half of my Fine Arts classes and consists of studio majors such as painting, ceramics, drawing, print making, sculpture, and photography. I’ve known many of my fellow colleagues for almost four years and it’s been phenomenal being surrounded by individuals who are like-minded artists creating and developing their place in the world as professionals. 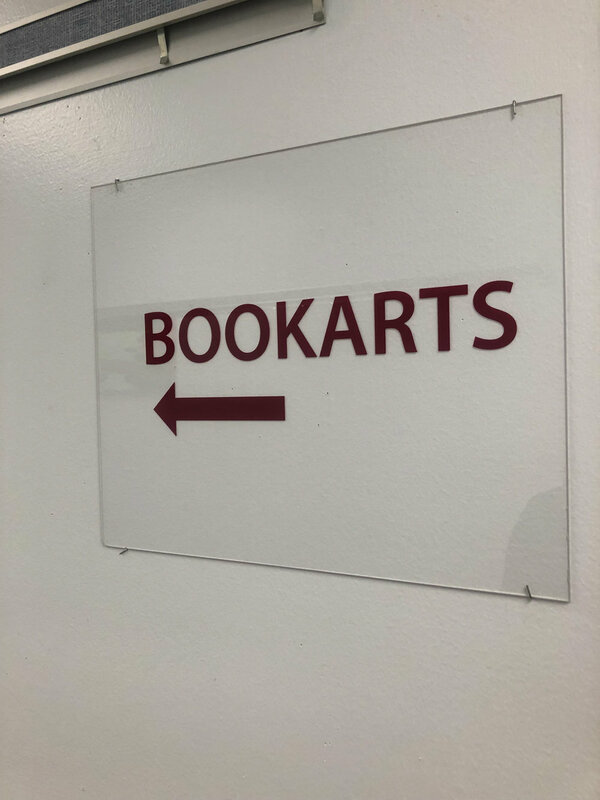 The hallways usually greet me with my colleague’s artwork hanging throughout the corridors, creating an inviting and prideful environment to house our work. After all, it wouldn’t be an art building with blank walls. First thing in the morning I have painting, which is actually my favorite time of day to work. I tend to be the most productive during the morning hours. The class sizes are usually pretty small, I would say an average of 5-6 students per class so this allows the learning environment to be very intimate and personal, which in return, allows us all to feed off of each other’s creativity. My personal studio space is in the corner of the painting studio where I house all of my paintings. My favorite thing about this area is the sunlight that pours in through the windows on sunny days. It’s the best. We are responsible for building our own stretcher frames, stretching our own canvas, as well as prepping it for oil paint. It is definitely a labor of love. We work primarily with oil paints, and are encouraged to explore at the 300/400 level in order to develop and solidify our artistic voice. I am particularly interested in abstract oil paintings right now, drawing reference from contemporary artists such as Becky Yazdan, Emily Filler, Andrea Wedell, Kate Carr, and so many more. Research is a crucial aspect of our learning process, so before we even begin painting, we generally do preliminary research and sketches. Walking to my afternoon History of Photography class consists of colorful stairs and the distinct color transparencies made by Hattie Lee leading up to the third floor. My last class of the day is my Book Arts class taught by Robert Rowe. Right now we are working on a ‘clam shell’ box for our sewn binding books we completed earlier. It’s as cool as it sounds. We are learning a lost art in book making and Professor Rowe takes full advantage of giving demos during our studio time. Then, if I’m lucky, sometimes my day as an art student ends with some of my favorite fellow artists at Project 1612. Here is a picture of us getting the garage/ gallery space prepped and ready for the upcoming 2019 exhibition year. I’ve learned so many professional and personal developmental skills during my internship there. It’s important to be activily participating in exhibitions and seeing the curation process first hand. In fact, I think this step is crucial in the process of being an art student. Haley Funk is an artist and student working in Peoria, IL. She is attending Bradley University where she is earning her Bachelor of Fine Arts in Painting, as well as her Bachelor of Science in Psychology. More of her work can be found on here. Jessica: I would describe the art I make as lyrical abstract expressionism. Non figurative. Instant gratification, impulsive, therapeutic, peaceful and bright. Highly influenced by music. Project 1612: When did you start taking yourself seriously as an artist? Jessica: I sort of gave up on art when I moved back to the midwest in 2004. I began painting again in 2011 and vowed to never stop painting, no matter where I am planted. To live a full, creative life, on the daily. Jessica: I couldn’t survive without music. Music drives me to see and create so freely. I am in a perfect place when I have music and paint. I have a whole other language going on here. 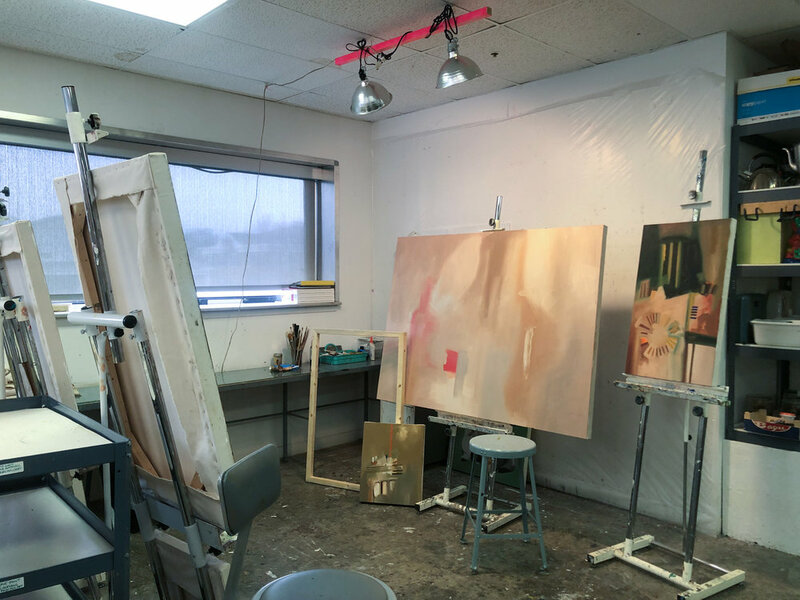 Project 1612: Has your studio practice changed since closing The Art Garage in 2017? How so? Jessica: Closing The Art Garage has been a good transition in my life. I have had time to enjoy my studio, create some really fun pieces and show a lot of artwork this year. The best part of this transition is being able to spend quality time with my husband, Kevin and our eleven-year-old daughter, Olivia. I’ve enjoyed digging deeper into life and sharing it, in color. Jessica: Problems in the studio are mostly with inspiration and motivation. I combat them both with music... good music. I’ve also had to move to a larger studio this year. I’ve enjoyed making large scale paintings lately, especially with room to move around while I work. Project 1612: What is your current body of work about? Jessica: I am currently creating a diptych for the Emerging Artists’ Collective Exhibit in February 2019. The main idea behind my next few works are bravery with freedom of expression. This process is both valuable to my mental health and my painting practice. Project 1612: What artistic movement do you most connect with? Project 1612: Do you have anything coming up that readers should be aware of? Jessica: Although I love to create in solitude, my art is deeply enriched by interactions and support from the art community. My advice for aspiring artists is to get out there and support others. Your practice will grow from learning about all types of art and all types of people. Get what you can out of being wherever you are. Jessica: I have had my ups and downs while being an artist in Central IL. I try to soak up all we have, but honestly I crave an even more populated and diverse art scene like that of other large cities. I will say, the artists here are AMAZING! They definitely outnumber their opportunities. Jessica Ball is an artist working in Peoria, IL. More of her work can be found on here. SJ: Narrative Figurative: I feel all human beings art hard wired to have an emotional response to the images of other human beings. The mind strives to create a comfort zone by comparing an image with its perceptions that are developed in the “Nature” aspect of nature/nurture, that our egos and identity are developed from. With that comparison a story or narrative is born. My work also takes a lean toward Neo-Surrealism. Sometimes whimsical and sometimes taking a slightly dark or dreamlike turn. Either way, I strive to start a story and leave it up to the viewer to take it the rest of the way. SJ: Good questions. I vividly remember being surrounded by old office papers covered with a five year olds masterpieces, in my grandparents living room, and proclaiming that I was going to be an artist. Maybe it was then. No matter what direction life has taken me, my inner foundation has always been art. I’ve been in many different studios of the years but with my recent retirement from the “Real World,” I have made it a priority to focus on being a full time artist. Heck, maybe its just now I have finally truly taken myself seriously. SJ: Dreams. I receive images through them and it’s like I have been charged with the responsibly to bring it to life. Some images will stay with me for years until I find the appropriate medium to tell the story. Then on to the next dream and story to be told. SJ: Time management due to a never ending flux of ideas flooding my mind. When I come close to completion of a piece I find myself wanting to move onto the next story. Making it difficult to manage my time efficiently, because sometimes I start on the next one. I overcome this with plain old work ethic. Head down and get it done. An unfinished piece doesn’t speak. SJ: Currently, I have focused on large scale pieces. The stories vary but the scale seems to be the drive. It carries a whimsical tone or a subtle social or spiritual reference. Project 1612: How important are your reference images to the final pieces? SJ: References are extremely important, since I am a studio painter primarily. I mix and match images that I have photographed with antique photos or even bits of magazine references. I pick our one small piece from a shot and use it to complete my stories. Project 1612: Besides painting, what other mediums do you work in? SJ: Graphite and charcoal and colored pencil. I was deeply involved with black and white photography years ago, so I love to create drawings that are in gray tones. Colored pencil is like painting to me, so I love the challenges it brings me. I also sculpt in oil based clay and currently have plans to create a large public piece to be cast in bronze. Project 1612: How long has your studio been at The Mill? SJ: I have been in The Mill for the past couple years and have been truly blessed with an incredible space. I have been many places in the area over the years and I feel I have hit a real groove in this studio. Project 1612: Do you have anything coming up we should know about? SJ: At this point, I am compiling a large body of work in preparation of a solo show at the Peoria Public Library in downtown Peoria, IL in July of 2019. It’s a space traditionally used for group shows, so I am needing enough work to look like a group but its all on me. There are a couple group shows I may participate in, the one that is the closest is the Emerging Artist Show in February of 2019. SJ: My advice to all artists is, if the muse has chosen you and you have excepted the call, do so with all of your soul. There will be situations and people that will do their best to direct you away from the callings. If an artist is younger and starting out keep in mind you have the resilience to preserve and by the time one finds themselves at my age they will have lived a good life and probably also created a financially sound like. The good life is probably most important though. Art is business, so work at what you love and it won’t seem like work. You just LIVBIG. SJ: The art community of Central IL has become the poster child for how a grassroots movement and the wealth of talented artists can get things done. The only thing we are missing right now is a legitimate gallery space to represent all of those talents. This area has so many master level artists that it more than rivals the large metropolitan areas of this country. And the rest of the country is just getting their first look at what Central IL has to offer. There are many, many good souls creating here. I think the world needs to look out for all of us! SJ Boyd is an artist working in Peoria, IL. More of his work can be found on here. Patricia: I have always been concerned with how, as societies we seem to build and destroy in the same breath. I think of myself as a figurative artist with an interest in the environment and ancient cultures. My work is about individuals and how they navigate through life. I model my figures in wax or clay and cast them in bronze because it is a material that connects us to past cultures, an idea that is important to me. I model both male and female figures in positions that are either standing or walking. The upright posture of the unadorned individual is by far my favorite and I have been told they embody the duel nature of vulnerability and strength. The core of my work is the isolated standing individual which is the most natural and direct posture that people take. Concerns with subject matter and choices of bird imagery add to the visual interest and content. Patricia: Taking myself seriously as an artist was at first difficult and took much longer than expected. I started pursuing a graduate degree in sculpture late in life. While in graduate school I recall listening to a critique of my thesis work given by a visiting artist whose interpretation did not match my explanation. What I knew to be the story behind the work, what informed the piece, was not what he saw, simple enough, but for me profound. The genesis of my ideas come from my life stories, for example, the memory of doing dishes at my grandmother’s while her parakeet was perched on my shoulder was the source for The Pedestrian. I take myself seriously each time I approach a new idea. Patricia: A number of things come to mind, first, the actual physical process, then researching for imagery. Recognition is always important but not what drives me. The love of art is in my DNA, the need to experience what artists have created and to create my own works. Identifying my life experiences and then connecting them to the themes that interest me drives much of what I do. The back and forth decisions that come with problem solving and of course the completed work can be very exciting. I have been in awe of artists, those who are working at a high level, thinking about and making unexpected aesthetic choices that move me intellectually and emotionally. Another aspect that drives me is my research, the search for ideas, a form or a line, and the connections with ancient works. For example, The Black Heron of South Africa was made using the direct wax method where I cast wax cylinders from discarded Pringles containers. I joined them together to create a column three feet tall, modeled a black heron and attached it to the top, and appliqued dozens of lizards on the surface. The theme became one of predator/prey. Later, while doing an online image search I discovered two miniature versions of my heron piece; one was a Udu West African musical instrument, the other a Benin bronze bird sculpture, the form of each was a cylinder showing a bird perched at the rim. Patricia: My biggest concern is having enough floor space for future sculpture work, scale has become an important element in my sculpture, I don’t want to be restricted in what I can do. My new studio is a little over 520 square feet with a twenty-foot ceiling, a cement floor, and no windows. I use one wall for drawing and have plans to build a modest workbench on the adjacent wall, dedicated for printmaking. This leaves the remaining two-thirds of the space for sculptural work. The challenge is to make use of this area so that my tools and materials are easily available but the floor space is left open. I have limited the size of my work tables to smaller rather than larger and … so they can be easily rearranged, equipped them with casters. The only shelving will be on the wax wall, the area set aside for heating and modeling figures in wax. I visualize the remaining space open and filled with sculptural works in progress. I plan to keep the remaining two walls open and free of clutter. 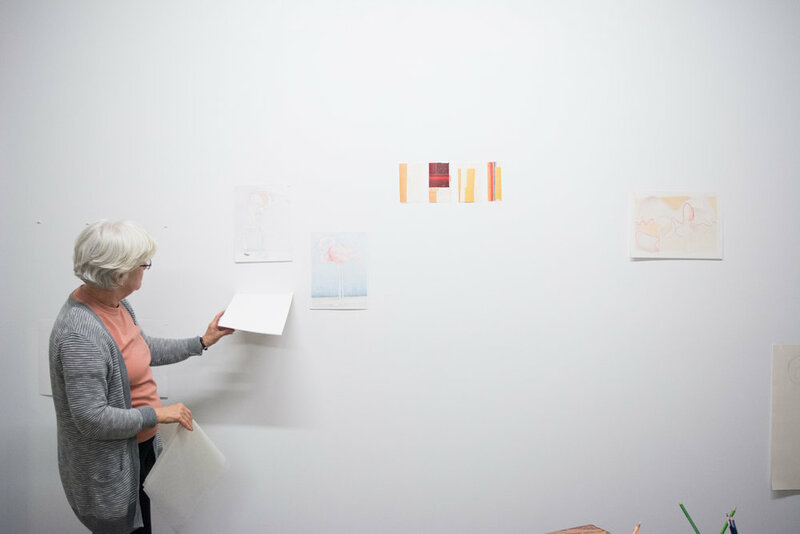 Pat: My current body of work, in its simplest form is about drawing, exploring composition and the decisions that accompany these activities. I took a three-month hiatus from sculpture to allow myself reflective time and to process the work done as a graduate student. I am a figurative 3-D artist first but also understand the importance of learning through other disciplines. My current body of work consists of drawings of bird images and portraits of people whose life work I admire. I view the drawings as preliminary works studies for woodcuts and larger works on paper. Bird imagery shows up frequently in my sculpture so I decided to do drawings of birds that are of interest to me. I am exploring two compositional arrangements, one linear changing the proportions of a grid the other circular laying down a spiral as a starting point. Project 1612: Can you talk about the bird imagery that shows up frequently in your pieces? Patricia: Much if not most of my aesthetic choices originate from an actual experience or my reaction to something I heard or read. For example, In Picasso’s famous anti-war painting Guernica, Picasso placed a bird in the top left corner appearing to land on a table or, it may have been fleeing from the carnage. I taught this work to young people for many years and wanted my students to understand it as a piece of art, as well as a visual document of an actual event. The Spanish town Guernica, had been obliterated by the Nazi German Air Force, the Luftwaff, prior to the start of World War II. Picasso’s painting has been studied and written about extensively, I came across an article that had been written at the time of the bombing, the towns people were afraid to return to the village until the birds returned. I shy away from talking about the symbolic meaning of birds and why I use them though I acknowledge they act as a signifier. Other memories that inform my use of bird imagery include that of growing up with parakeets, not caged but allowed to fly freely through the house, the flamingo deco in my grandmother’s house, my mother’s romantic interest in swans, my sisters’ talents as musicians, to sing and to play the piano. The choice of what music I play in my studio drives my thinking. Project 1612: You are a sculptor, but have also been exploring printmaking, drawing, and collage. How do you connect the 3D and 2D aspects of your work? Patricia: Yes, I have been exploring printmaking, drawing and collage. I find similarities in the processes, the research and of course the subject matter. Working in multiple disciplines helps to keep my thinking fresh, to not become predictable. I truly enjoy the challenge that comes with using different materials. And, of course, casting a work in bronze is very expensive, it requires hours of time and physical labor to complete. At this stage in my live I felt it important to explore activities that are physically less demanding. Project 1612: How long has your studio been at The Mill? And how does this studio space differ from previous studios? Patricia: I have been at The Mill four years. The owners were just beginning to develop studio spaces for the art community when I rented a small space. I was looking for a quiet area to read, do research and eventually write my thesis paper. I was one of a handful of artists to first locate in the building. This space was located on the second floor and well suited for quiet reflective work. Upon completion of my degree, I needed a larger studio to do sculpture, fortunately a ground floor studio became available. Though still small for a sculptor the new space has been ideal for me. It is still quiet, with the same finished white walls and solid wood beams, and easily accessible from the parking area. I am now located at the back of the building directly across from a local pottery. Patricia: I would advise aspiring artists to know the what, the why and the where. Patricia: My art community experiences are limited to towns I have live in or lived close too; Decatur, Peoria, Bloomington/Normal, and Champaign/Urbana, the latter two, university towns. While living in Decatur, and now in Peoria, I had the good fortune to meet, work with and learn from two highly accomplished artists, both long-time residents of Central Illinois. Both artists are connected to the larger art communities of Lithuania and California, and the current art community in Chicago. My work practice includes looking at art, museum quality and contemporary works. It is an easy drive to Krannert Art Museum on the campus of the University of Illinois to view their graduate shows, current exhibitions and collections. I often travel by train to visit Chicago; University Galleries is located next door to the train station so I visit it as often as possible. The Contemporary Art Center of Peoria was founded in 1998, areas for artists to work, exhibit and sell are continuing to increase, and the Peoria art community is engaged in exposing young people to the arts. From what I have experienced the arts are alive and well in Central Illinois. I have managed to find in Central Illinois what I require to work, but frequently seek the energy of a metropolitan environment. Patricia Whalen-Keck is an artist working in Peoria, IL. More of her work can be found on here. In-process piece in Barbie's studio at the Prairie Center of the Arts. Barbie: My art is contemporary, mostly abstract, occasionally autobiographical. Other times it is completely experimental in a new process or medium. Barbie: I am new to the physical process of art-making. In 2014, I began creating colorful abstract and textural compositions using unaltered digital photography. By 2016, I had developed enough confidence to make the transition to creating work with my hands. I liken myself to a sophomore in college. This seems to work in freeing me mentally to continually explore several mediums. I may, at some point, decide upon and stick to a particular medium, yet I am loving the discovery process of determining which mediums and especially processes I am loving best. Currently, I am digging into silkscreen monoprints. I have many experiments and projects planned for the next 12 months culminating in a two-person show, in October of 2019, with Sarah Nesbit in Peoria. Barbie showing a newer piece while standing in her studio. Barbie: I have a weird kind of need to do it. I think about art every day. I dream about projects and compositions. My life is steeped in art. I look, see and think about my world through this lens. It’s a pleasant way to live. Barbie: Asking for help in how to do something. One of my personal challenges is letting down my guard to trust others to not think less of me because I do not know how to do something, or that they don’t mind giving of their time to teach me. At a young age, I strove to be completely independent. I still work on embracing asking for help from others and tamp down the feeling I should be figuring it out on my own and not “bothering” others. Another challenge has been confidence in my work. Having a studio in an open environment has been critical and helping me to become less sensitive to others just seeing my work, much less in getting critiqued or feedback. I work on building compromise and relationship with both my inner critic (where everything is s***) and in my inner rebel’s defensiveness (I don't give a f*** what you think.) I know these are protective, extreme, unrealistic and untruthful perspectives that are not helpful. My reality just lies somewhere on that continuum, and really much closer to average than I care to admit. Project 1612: What is your current work about? Dioramas of significant rooms in Barbie's adult life hanging on her studio wall. Barbie: I am currently working on two major bodies of work. The first is experimentation with paper and silkscreen monoprints, while learning the boundaries and process of printmaking. The second is work using dioramas to depict significant rooms in my adult life. These are dealing with mental illness, decision making, struggle, opportunity, accepting help, overcoming and creating a successful life. Project 1612: How long has your studio been at the Prairie Center of the Arts? And can you tell us about your role at the PCA? Barbie: I have occupied my studio at Prairie Center of the Arts in the Warehouse District since March of 2017. The Prairie Center accepted me into a 6-month residency the year prior, yet, my father became very ill and passed away in September of that year. Fortunately, Joe and Michele Richey gave me time to grieve until I was ready to move forward. I accepted their invitation for my residency. I have now been here for nearly a year and a half. My nature is to take care of my surroundings and integrate the people who intersect with my life. I help with activities and community building which has resulted in a good working relationship. I am a volunteer. Barbie's work table filled with artwork, newspaper clippings, and notes and artwork from other artists. Project 1612: You also just started an arts meeting called ‘The Bimonthlies.’ What is the purpose of this meeting? Barbie's desk with knock-knacks and gifts from artists. Barbie: The Bimonthlies is to provide a platform for the many visual arts organizations, groups, and galleries, educators, and artists in our region. We come for an hour meeting every other month to learn about and further integrate with each other. It was created with enthusiasm and vision of one of the co-creators of Project 1612, Jessica Bingham. Jess and I pitched to Kate Schureman of the Peoria Riverfront Museum and Jenn Gordon of ArtsPartners of Central Illinois who also enthusiastically came on board to explore the possibilities. The meetings are held at the Peoria Riverfront Museum and ArtsPartners assists with promotion of the event. Barbie: Be fearless. Step out of your comfort zone. Surround yourself with people who are positive, trustworthy, and motivated. I practice defining what I want to create in my life and then put together a loose strategy of how to achieve that. Then, with risk and persistence, I pursue those goals. Another key component to success is to assist others in the pursuit of their goals. This is where I learn a great deal about art and life. Barbie: I believe the Arts community in Central Illinois is strong and vibrant. Frankly, there is so much to do and participate in that it is impossible to do it all. And this is just talking about the visual arts, it does not include the other thriving Arts happening in our area. However, I also see a need for community building and higher levels of cooperation between our artists and arts organizations. These stronger relationships and alliances are what will bring our Region to the next level as a destination for the Arts. We have done a really good job of creating a foundation for the arts. However, my professional experience in community and tourism development tells me is that we collectively need to change our strategy and build momentum move forward. Our strategy needs to focus our activities on becoming a larger destination or we will continue to perform only foundational results. I believe we have the resources, talent, and people to get there. We just need to do it together. Of importance is that incredibly diverse offerings we have: museum, park district, retail, ArtsPartners, Heartbreaker Studio, Project 1612, The Peoria Art Guild, Persimmon Lofts rts and events, Collecture, Prairie Center of the Arts, Illinois Art League and the other awesome art organizations, Bradley University, Illinois Central College, a vibrant First Friday started up by CIAO and the spinoffs throughout the month. I could go on and on about the good stuff happening here the incredible, wonderful artists and supporters we have here. It’s a really good time to be into art in Central Illinois. Barbie standing in her art-filled studio. Barbie Perry is an artist working in Peoria, IL. More of her work can be found on here.